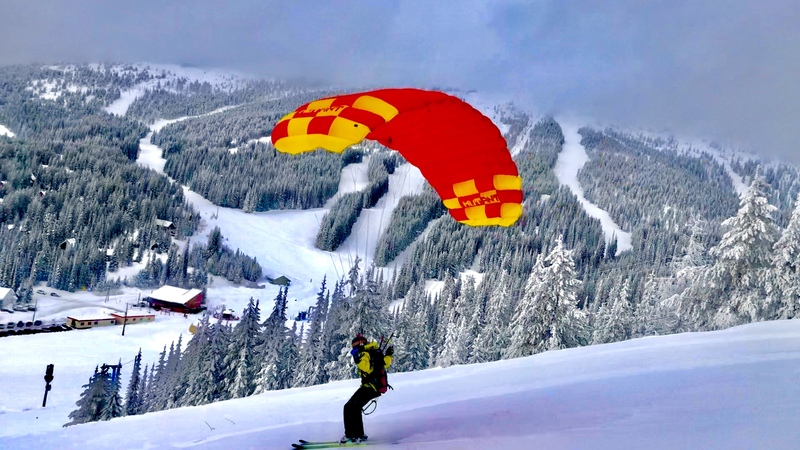 Baldy Mountain Resort located in the Okanagan BC is happy to welcome HPAC P2, or higher, certified pilots the opportunity to launch and land within the Resort boundaries through the winter months for the 2018-19 operating season. Keep an eye out as we look to offer the general public the opportunity to fly with a tandem Pilot. 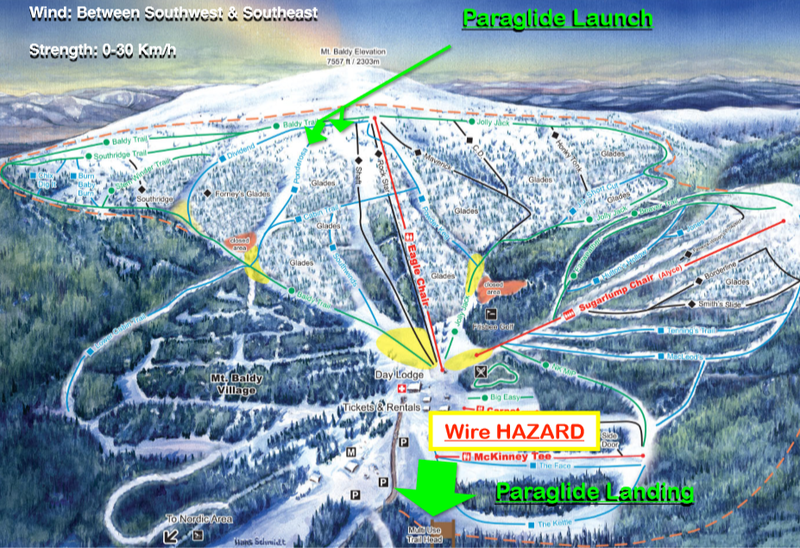 Please note that the Eagle Chair needs to be operating for launching to take place. Planning is being carried out for opportunity to fly in summer months as well, stay tuned. Pilots MUST be current HPAC members & carry a P2 or greater rating. Pilots MUST register daily at ticket office to fly & will receive a 20% discount on day ticket. An initial winter use waiver must be read and signed. 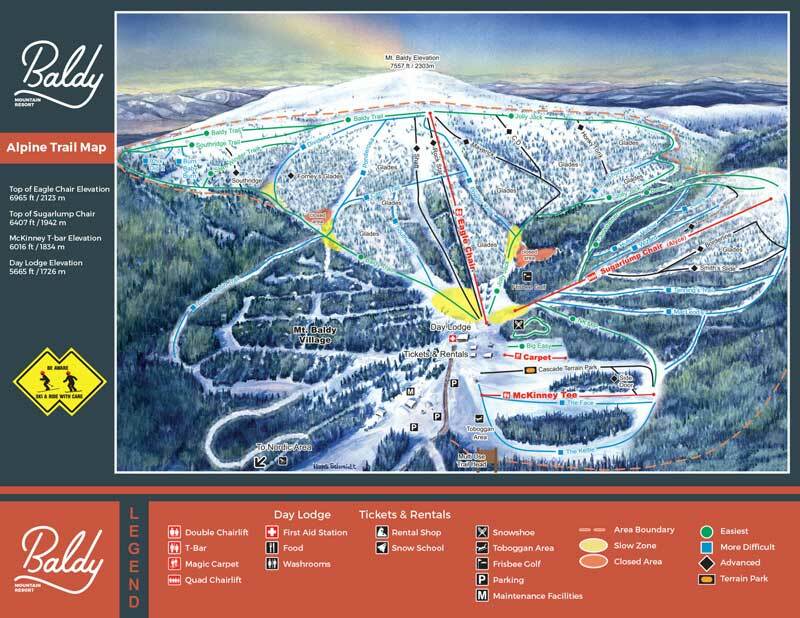 Note: if you are a season pass holder at Baldy you must check in at the ticket office to sign the waiver and get your pilots ticket at no extra charge. A site orientation by Baldy staff is required for first time pilots. 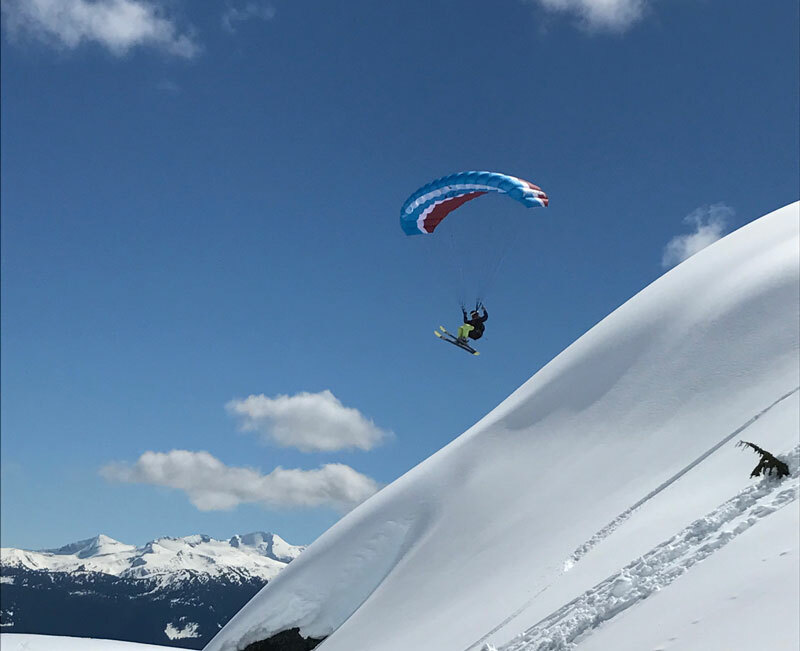 Paraglide pilots can foot or ski launch. Speedflying pilots must ski launch. 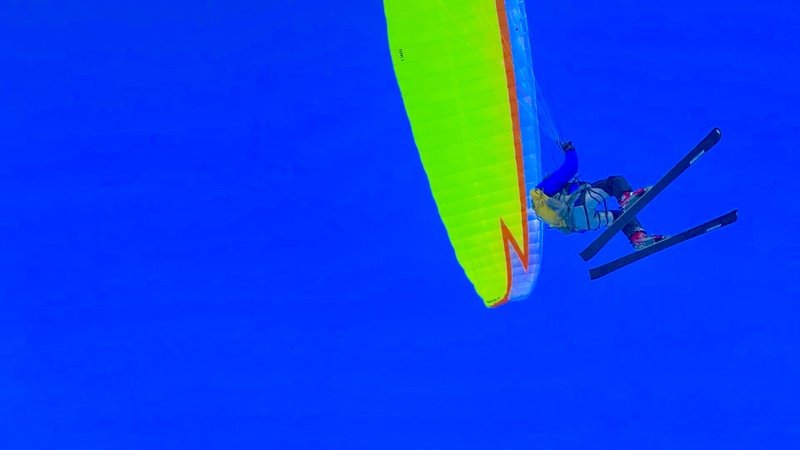 Pilots must use sanctioned launches and landings (indicated by wind socks) map. See map below. Pilots can only launch in conditions that are suggested below. 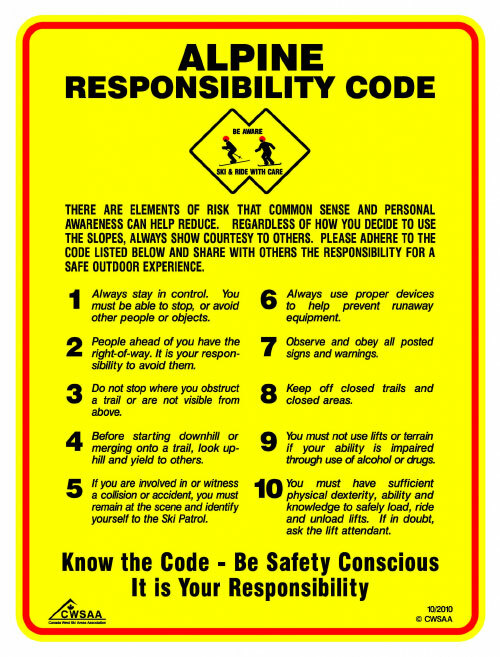 Baldy Mountain Resort has the right to deny all flying activity when conditions are not within site parameters. Baldy reserves the right to deny any pilot access based on their flying skills. Pilots must yield right of way to all skiers and snowboarders. 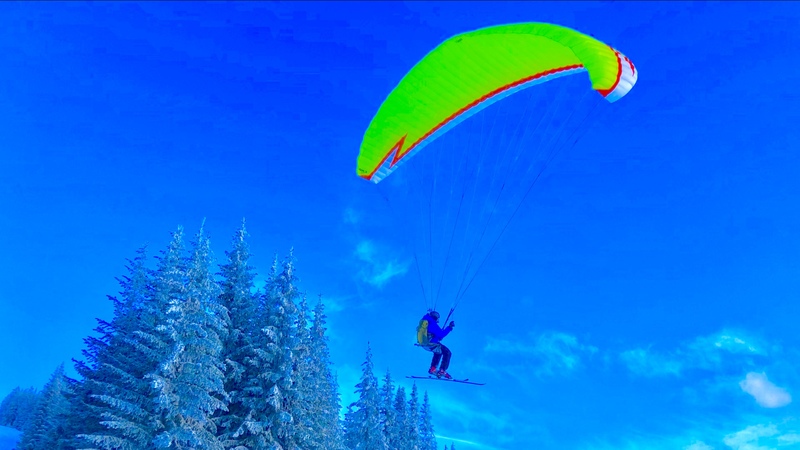 We ask all pilots to ensure the safety of all our clients and give priority to the Skiers and Snowboarders . We have area’s for launch and landing signed and cordoned off to allow you to safely operate. At no point should a pilot take any risk that could cause harm to a person or the resorts infrastructure. Below please find a map which will soon be updated with highlighted launch and landing area’s (also available at the ticket office) and these should be the only locations that pilots should use. Baldy mountain Resort reserves the right to refuse permission to fly at any time. Check out our weather forecast, webcam and conditions to see if is a good day to launch. The favourable wind direction for launch and the strength will be communicated soon. Want to get into the sport of flying? Check out the wealth of information from HPAC here. This site is flyable in light winds only. 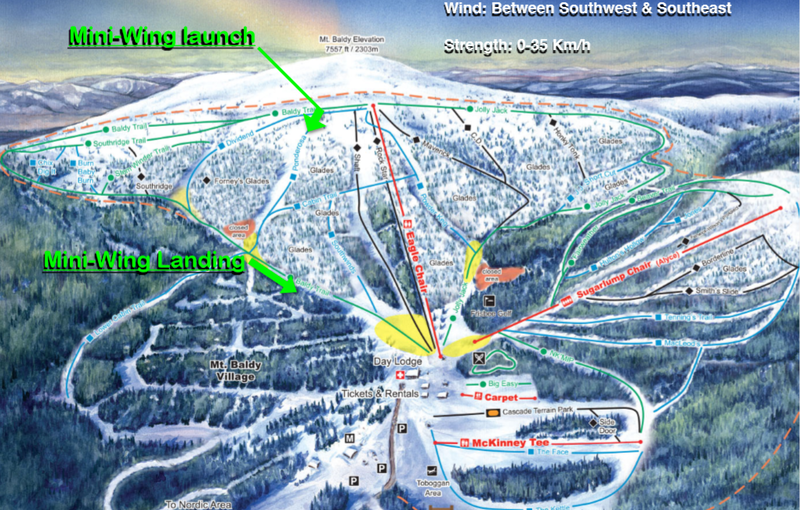 Baldy has the right to stop launches if wind is above 33 km/hr. Both Paraglide and Speedflying landings are assessed as advanced P2 spot landing. Hazards do exist at the PG lz. Mini-wing pilots must have radio contact with a spotter at the landing. 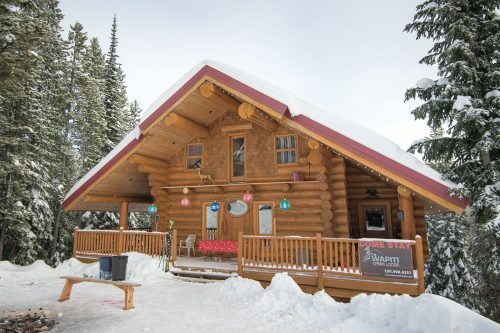 Check out our on mountain accommodation options here and ski and stay options here (no discount offered on lift ticket if you use Ski and Stay as discount already included). If you have questions about the resort and its operations please contact us on 250.485.7593. If you have specific questions for a local pilot please use the contact us form.